With a different take on streaming to its rivals, there’s a lot to like about this full-width network player. Read our Mitchell & Johnson WLD+211T Review. Part of a small range of full-width separates that include an integrated amp and CD player; the WLD+211T is a DLNA-compatible device that allows for wired and wireless streaming up to 24-bit/48kHz. It offers FLAC and WAV support, but not ALAC or AIFF. You can also use it as a preamp and the volume controls the analogue output. Digital optical and coaxial outputs are provided for a degree of upgradeability. Additional features are relatively sparse – given this is the second most expensive player here – but one inclusion is decidedly unusual. As well as support for internet radio stations, the WLD+211T is fitted with DAB, DAB+ and FM tuners. 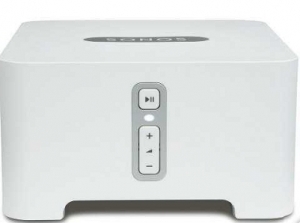 Otherwise, features are limited to Spotify Connect (controlled via the third-party UNDOK app), but no AirPlay or Bluetooth. A remote control is bundled, while the front panel display shows status information – which is very useful and can be hard to discern on some of its faceless rivals in the group. While the functionality of the Mitchell & Johnson is rather limited, it goes some way towards making amends when it comes to using it. Setup is a breeze and it is entirely stable once up and running. More importantly, there is a refinement and control to the way it makes music that is likely to win it many friends. Adagio For TRON is delivered with a richness and sense of space around the orchestra that makes for an unforced and very natural presentation. As the piece reaches its crescendo, there is a slight lack of urgency but this never tips over into sounding slow or languid. This is also the case with Dissolved Girl. There is a richness to the vocal delivery that is so pleasant that you find yourself ignoring the discernible lack of resolution in the bass. This takes the form of a slight sense of overhang to the very low notes starting and stopping. It’s not severe, but it robs the music of a little of its intensity. The same competence with the midrange and treble is used to good effect with Sinner In The Sea and there is enough rhythmic assurance to the low end to capture the unique feel of the track. It also allows Mr Clean to excel with an excellent rendition of the lead trumpet and convincing sense of its relationship to the other instruments in the quintet. Lacking a dedicated app of its own, the WLD+211T instead directs users to the UNDOK app. It isn’t the most spectacular piece of control software in the group, but it is stable, fairly logical to use and allows for simple browsing of a music library. The only major grumble is that upon exiting an album page the app takes you back to the top of the album list, which with larger libraries is annoying. More positively, Spotify Connect works seamlessly (and, of course, uses Spotify’s own software). This allows the WLD+211T to show off its ‘Sound Shaper’ functionality, which is designed to enhance compressed music. As you can’t turn it off, comparisons are tricky, but the overall performance is impressive.